Here you can see the lies coming from the president’s office. Mngadi is the chief director for communications (Jacob Zuma’s chief Spin-doctor) in the Office of the President, in the Presidency. It comes after allegations in the Sowetan that President Zuma is an utter failure and that blacks are starting to question whether the New (Improved) South Africa is really better than Apartheid South Africa. He comes up with figures quoted from nowhere. No proof of any of these statistics, but wants to dazzle a few stupid liberal whites and their beloved noble savages with a few figures. Problem with the ANC is that nobody swallows their lies anymore. It is so easy to counter, expose their lies and prove them wrong. They have zero credibility. Everyone can see they are only in it to enrich themselves and bugger the poor. But let us have a look at these ANC lies anyway, because this is standard ANC spin to convince blacks that the ANC is good towards them and that South Africa under ANC corruption and misrule is better than Apartheid South Africa. One finds these recurrent lies on several online forums and in several debates so it is good to be armed with the truth in such instances. 1. More than two million houses have been built for the poor, giving shelter to over 10million people. 2. Six million households have gained access to clean water since 1994 and electricity has been connected to nearly five million homes. In 1994, only 62percent of households had access to clean drinking water, today 93percent do. 3. In 1994, only 50percent of households had access to decent sanitation, today 77percent do. In 1994, only 36percent of South Africans had access to electricity, today 84percent do. 4. Today the majority of people are provided free basic services in water and electricity. 5. By 2010, close to 15million people were receiving social grants. Of those, 9,5million are children aged under 14 years, compared with just 2,4million in 1996. This year the child support grant has been extended to children up to the age of 18 years, an additional two million children, in order to alleviate poverty. 6. More than 400000 children receive government subsidies to attend early childhood development centres. More than 8million children at primary and secondary schools benefit from school feeding schemes. 7. This year government announced expanded access to tertiary education. Student loans are now being converted into bursaries for qualifying final-year students. Students in further education and training colleges who qualify for financial aid are now exempted from paying fees. 8. Crime is declining. The murder rate, for example, declined by 8,6 percent in 2010. Were South African Blacks ever cannibals? 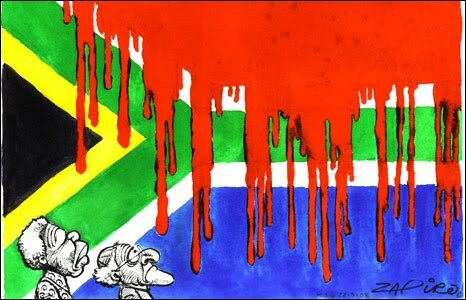 Apartheid: A Crime; or Race Realism?